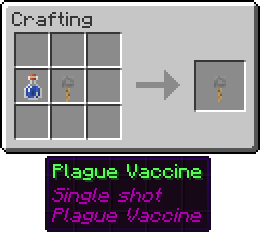 To increase immunity to one particular disease you are able to craft vaccinations to use on yourself or other players. 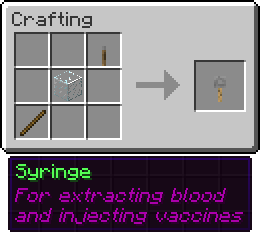 to do this just craft a Syringe, you can then craft a syringe with a curative potion you have made to turn it into a vaccination injection for that disease. 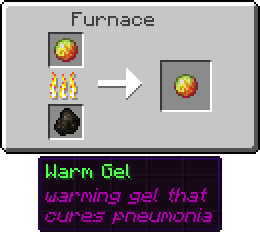 Just use it on yourself or another player to increase the immunity level to that disease. Note not all diseases can be placed into thrown vials or put on arrows..
Stay cool by wearing less in warm climates, sheltering indoors in desert sun, not holding hot items such as lava buckets, and going out at night. Stay warm by wearing more clothes in the cold, lighting campfires, carrying hot items, staying out of water, and stay indoors during storms and at night. /temp details - show more in depth details of what is affecting your temperature. MR_Asshole, Ethon6, Hemza and 15 others like this. I liked your plugin very much. But I think you could make a different permission node for "/disease remedy give" instead of using "disease.remedy". I made a permission group for doctors and I want to allow the use of "/disease remedy list" and "/disease remedy <remedy>", but I can't allow it because it turns on the give command too. Hey, i'm sorry but diagnosis doesn't work. Can you fix it or tell me what i did wrong? Thank you so much, this is an amazing plugin. I'm using spigot 1.12.2 and when i start the server and the plugin loads in the console occurs this error. And when I do the command '/health' in the console occurs this error. Can you add language files? I think it's better when you add language files. Thank you so much for producing such a plugin. 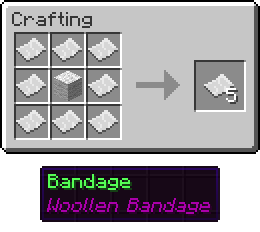 Does not work on 1.8.9.. can you add support for that? Is it possible to add immunity permits to all diseases and injuries? or what would they be? 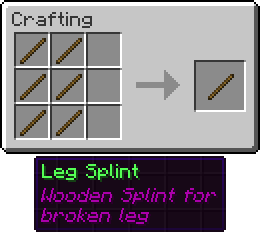 is that I would like some ranges to be immune to breaking legs or anything else.